The key to my heart is through my stomach, and a burger is a great way to get there; But, when you think of a burger you think of grease/fast food. I recently sat down to ask the team at Hero Certified Burger what would go into a healthy burger, which is made with fresh toppings, and REAL cheese. 100% Angus Beef (raised without hormones or antibiotics) Vegetarians can swap this for a meatless Soul Burger patty! Alternatively, you could go bunless. 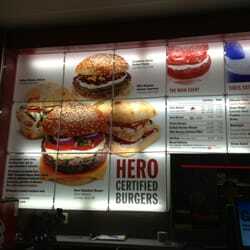 LettuceTo find your nearest Hero Burger location, or put together your own burger visit: the Hero Certified Burger official website ! And stay tuned for an all new #FitnessFriday next week!